Should I pre-drill before nailing? I know that pre-drilling before screwing has many advantages but am wondering if pre-drilling is also useful for nailing. 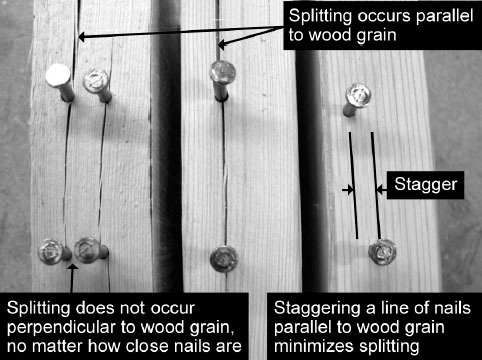 Pre-drilling for nailing seems to make sense because nailing also causes wood splitting. But, it may be disadvantageous because it may reduce the power to grip the nails, making them loose. Should I pre-drill before nailing or not? Unfortunately the answer to this is, it depends. With certain woods, particularly when nailing near the ends of boards, pre-drilling can be advisable. A different fix when nailing near the end of a board is to leave the board over-long (where possible) and then cut to length after the nails have been driven home. This is often done on decking boards. In case you're unaware, the type of nail matters here. Nails with blunt tips, perhaps counter-intuitively, split wood less than sharp nails because they crush wood fibres as they go in rather than parting the wood ahead of them (working like a wedge). And oval nails are better than round nails as long as the long axis is oriented correctly, in line with the grain. Where the nails you're using are sharp and you'd like to take advantage of the effect of a blunt tip a very old tip is to put the head of the nail on a hard surface and tap the tip with the hammer to blunt it, but it's very easy with soft wire nails for this blunting blow to bend the nail slightly. So it's much more reliable to snip the tip off the nail with side snips or pliers. Nails are commonly only mild steel wire and even with a beefy nail this isn't too difficult to do. But, it may be disadvantageous because it may reduce the power to grip the nails, making them loose. If the hole is drilled full size that will occur. The drilled hole should be undersized, roughly 75% of the diameter of the nail. If there is a danger of the nail splitting the work piece, PRE-DRILL. Otherwise nail away..
Not the answer you're looking for? Browse other questions tagged nailing or ask your own question.